In a refreshing acknowledgement that some people in Hollywood recognize that there are issues more important than awards season, the stars and producer of the sitcom Mom announced that they are foregoing the usual “for your consideration” Emmy ad campaign. Instead, the show will spend that $250,000 ad budget on a donation to Planned Parenthood. Variety announced today that “Mom star Allison Janney and series co-creator/exec producer Chuck Lorre on Thursday launched the effort to raise awareness of the threat to Planned Parenthood funding as the Republican-backed American Health Care Act makes its way through Congress.” The pair was also expected to appear on CBS This Morning today to push the campaign, which will include an appeal and a link so that Mom fans can donate to PP as well. Planned Parenthood serves 2.5 million people a year throughout the country, include those in areas where other affordable health care facilities are not available. 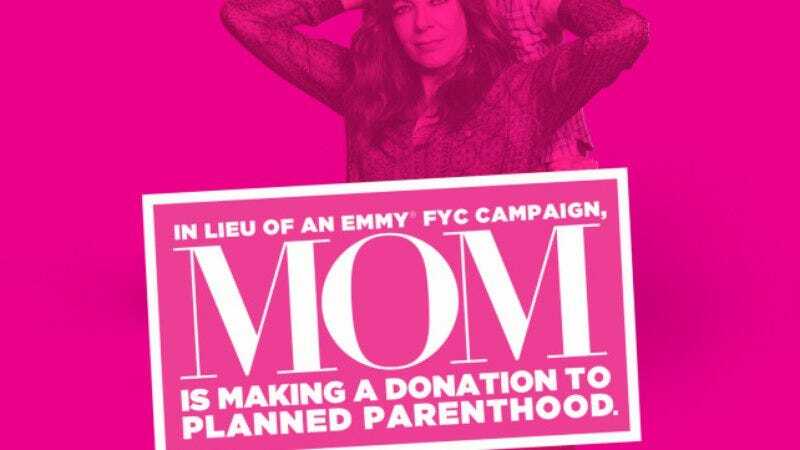 Sue Dunlap, president-CEO of Planned Parenthood Los Angeles stated, “Generous support from our community fuels this work, and we are honored that the team behind Mom is launching this campaign at this critical time.” It’s an inspiring move that other series and productions would do well to follow.